Where are these guys running to? They must be late! There’s something I really enjoy about this drawing which is why I’m posting it. It was drawn in a truly emotional time in my life. You can add whatever poetic meaning you want to it. Just enjoy it. i hope it’s not an emergency….there is great emotion in it, a sense of urgency. hope things are better now! I really like the freedom and feelings in your lines. 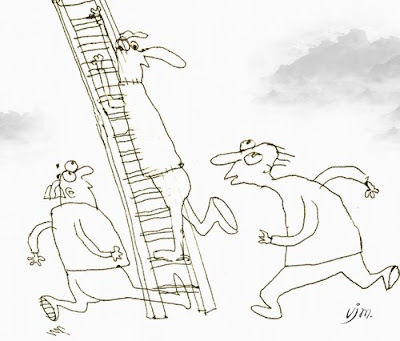 It reminds me of climbing the corporate ladder in this buesiness climate. Great work. nice expressions and expressive line too. A dream perhaps. They say when you think about, or dream about, running then you may be trying to escape difficulty in your life. Really great illustration. I do enjoy it. OK, you asked for it. Here is a post I did a while back, and there are links to all my ladder drawings. I love ladders! I love the movement in this, where ever they are going, they are going fast!